If you want to taste neglect over a period of decades, New York City has a good menu selection. I imagine many beaten down areas have resistance to change and wholesale renovations do not necessarily see the type of lasting transformation that was initially planned. There just is enormous inertia when it comes to areas which have had a long history of decline. However, NYC has not really put quality of life or beautification at a priority - managing this large city and just getting things (like the subway system) to work is an achievement and most residents learn to be satisfied with this. We have many areas that have deteriorated for decades. Times Square is a perfect example. Although substantial improvements were made, the immediate surrounding area still has a seedy feel to it. It's just like a cancer with only a chance of partial remission - we irradiate the problem but cancer just creeps back. Time will tell whether we see the same effect at Coney Island - 2008 saw the final closing of Astroland and other amusements, with big plans for redevelopment. 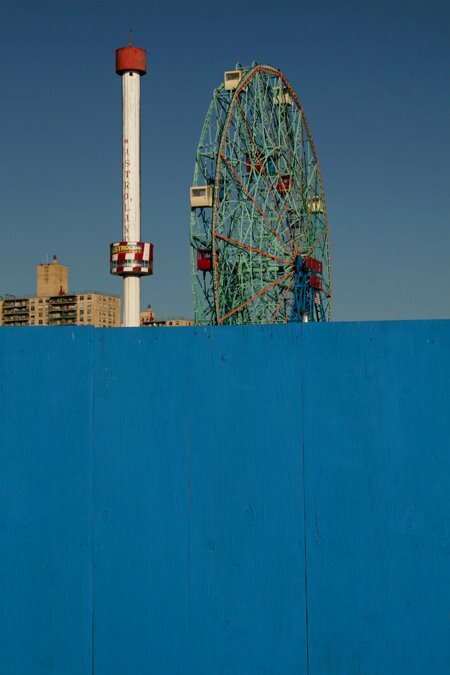 Coney Island was a world class resort at one time with millions of visitors annually. It was the world's largest amusement area between 1880 and World War II. There were numerous competing amusements parks - the three largest were Luna Park, Dreamland, and Steeplechase Park. I recommend viewing photos and films of these parks in their heyday - they are shockingly beautiful and spectacular. Luna Park burned down in 1944. In my visits over the last several years, I have found Coney Island rather depressing, excepting for the annual Mermaid Parade. This last Saturday, however, I found it pleasant - absolute perfect weather, spectacular blue skies, good company with three spirited friends including a former NYC Brooklyn resident (see Friday) all conspired in a great day. See the series of photos here. A stop at Nathan's required a greasy snack - we shared French fries and fried clams. Chain link fences and vestiges of former rides and games made for good photo ops. The boardwalk was pleasant, particularly with the few isolated merchants. They were actually attractive set against wood, sky and sea. Partial remission?